The U.S. Air Force is standing ready for this week's much anticipated return to Earth of a robotic space plane that has spent more than a year in orbit on a secret mission. Air Force officials say landing day for the unmanned X-37B space plane is imminent, and could occur on Friday (June 15). But weather conditions at its intended landing site at Vandenberg Air Force Base in California, as well as other factors, will determine when the spacecraft's will ultimately land. "Team Vandenberg is prepared to safely receive the X-37B at a moment's notice," Air Force Lt. Austin Fallin told SPACE.com in an email this week. "Exact landing date and time depend on weather and technical considerations." 6/16/2012 - VANDENBERG AIR FORCE BASE, Calif. -- The X-37B Orbital Test Vehicle (OTV), the Air Force's unmanned, reusable space plane, landed at Vandenberg Air Force Base at 5:48 a.m. (PDT) June 16. OTV-2, which launched from Cape Canaveral Air Force Station, Fla., March 5, 2011, conducted on-orbit experiments for 469 days during its mission. "Team Vandenberg has put in over a year's worth of hard work in preparation for this landing and today we were able to see the fruits of our labor," said Col. Nina Armagno, 30th Space Wing commander. "I am so proud of our team for coming together to execute this landing operation safely and successfully." "With the retirement of the Space Shuttle fleet, the X-37B OTV program brings a singular capability to space technology development," said Lt. Col. Tom McIntyre, X-37B program manager. "The return capability allows the Air Force to test new technologies without the same risk commitment faced by other programs. We're proud of the entire team's successful efforts to bring this mission to an outstanding conclusion." VANDENBERG AIR FORCE BASE, Calif., June 16, 2012 -- Boeing [NYSE: BA] today announced the successful de-orbit and landing of the second X-37B Orbital Test Vehicle (OTV) for the U.S. Air Force Rapid Capabilities Office. The X-37B landed at Vandenberg Air Force Base at 5:48 a.m. Pacific time today, concluding a 469-day experimental test mission. It was launched from Cape Canaveral Air Force Station, Fla., on March 5, 2011. OTV-1 was the United States’ first unmanned vehicle to return from space and land on its own. Previously, the space shuttle was the only space vehicle capable of returning to Earth and being reused. 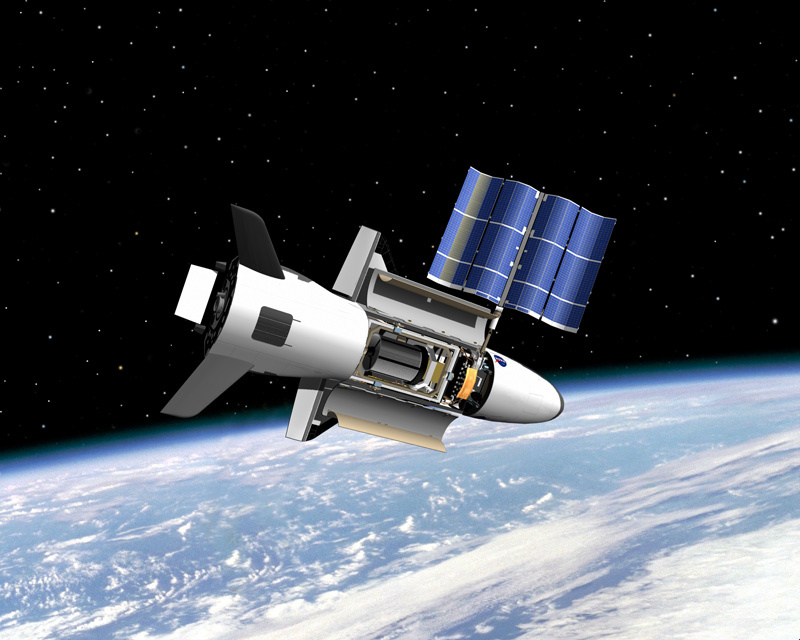 The innovative X-37B combines the best of an aircraft and a spacecraft into an affordable, responsive unmanned vehicle. Boeing's commitment to this space-based unmanned vehicle spans a decade and includes support to the Air Force Research Lab's X-40 program, NASA's X-37 program, and the Defense Advanced Research Projects Agency's X-37 Approach & Landing Test Vehicle program. A unit of The Boeing Company, Boeing Defense, Space & Security is one of the world's largest defense, space and security businesses specializing in innovative and capabilities-driven customer solutions, and the world's largest and most versatile manufacturer of military aircraft. Headquartered in St. Louis, Boeing Defense, Space & Security is a $32 billion business with 61,000 employees worldwide.